The 2018 World Diamond Congress, the official forum of the general assemblies of the World Federation of Diamond Bourses (WFDB) and the International Diamond Manufacturers Association (IDMA), will be held in Tel Aviv from June 19 -21, 2018 at the Tel Aviv Hilton. In keeping with Israel’s focus on innovation and its reputation as “Start Up Nation”, this year’s congress will highlight the role of technology in advancing the diamond industry. 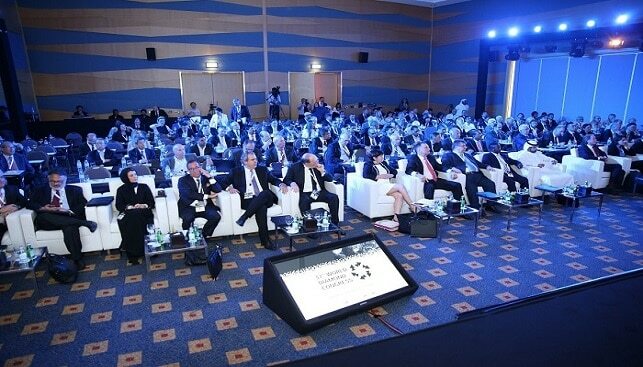 The Congress will be attended by many hundreds of guests from over 30 countries, including leading members of diamond bourses around the world, mining and rough trading companies, diamond manufacturers, supporting economic sectors and government representatives. The program will focus on how technology is contributing to the world diamond industry today and in the future. It will include a presentation by Sarine, the leading developer of technologies for diamond trade and manufacture. Moreover, guests will be invited to visit DiamondTech, the Innovation Center of the Israel Diamond Exchange and to meet some of the start-ups working there. Preparations for the 38th congress are being coordinated by an Organizing Committee comprising representatives of the Israel Diamond Exchange (IDE) and the Israel Diamond Manufacturers’ Association (IsDMA). Israel Diamond Exchange President Yoram Dvash, who is Vice President of WFDB, said that the Israeli industry is very happy to host the upcoming congress. “Israel last hosted the World Diamond Congress in 2006, and prior to that in 1996. We look forward to the opportunity to welcome lots of veteran and new friends and to provide them with an enjoyable stay. We are planning a stimulating program, and we are certain that our guests will be interested in learning about the many innovations we have instituted in the Israeli diamond center”, he said. World Diamond Congress Chairman Yehezkel Blum said that everything is being done to make the 38th World Diamond Congress a successful one. “We guarantee that our guests will receive warm hospitality and an exciting program. Moreover, Tel Aviv is a great backdrop for the congress, with beaches, restaurants, sightseeing and more. Join us for a great event”.